The St. Louis Cardinals announced today that they have teamed up with the Mayor of St. Louis and other civic leaders to launch #STLisLou, a season-long campaign to honor Cardinals Hall of Famer Lou Brock, celebrate the St. Louis community, and raise money for children with diabetes. The Cardinals will formally honor Brock in a special #STLisLou ceremony prior to tonight’s game against the Cubs. The Cardinals are encouraging fans to show their affection for Lou Brock all season long by sharing video messages, photographs and other messages via social media using the hashtag #STLisLou. The team is challenging fans to answer what does Lou Brock mean to you and what does he mean to St. Louis and the Cardinals? Fans can learn more about the campaign and see what others fans are posting to social media at www.cardinals.com/lou . The St. Louis Cardinals partnered with Explore St. Louis and Downtown STL to develop #STLisLou and will be working with both organizations through the season to engage fans via social media with special promotions such as “Tuesday’s Are Lou’s Day – Find Lou in the Lou!”, a weekly social media based scavenger hunt around town that will reward lucky fans with tickets, exclusive #STLisLou Lou Brock autographed baseballs and other prizes. Throughout the season, area hospitality workers and Downtown STL Community Improvement District (CID) Guides will be wearing a commemorative #STLisLou button as a show of support and chance to educate visitors about the campaign, as well as raise awareness for the #STLisLou fundraising effort to help children with diabetes. All proceeds from the sale of the #STLisLou button will go toward the special fund. Fans can purchase the button for $5 at Busch Stadium in the Cardinals Team Store or in the Cardinals Authentics store, as well as at the Cardinals Authentics Store at Cardinals Nation in Ballpark Village. Fans can also purchase the buttons for $5, plus shipping & handling fees, or make a donation to the fund directly at www.cardinals.com/lou . The team is planning a variety of other special #STLisLou promotions throughout the season to keep the campaign fresh, including a theme ticket promotion on Monday September 12th where fans who purchase a special theme ticket will receive a commemorative bobblehead replicating the #STLisLou image of Lou Brock on a Clydesdale. The image, which was drawn by local artist Dan Martin, is a fun homage to the iconic statue of Saint Louis on Art Hill in Forest Park which served as a symbol of the city prior to the construction of the Gateway Arch. In addition to the regular Theme ticket, there are a limited number of VIP packages available, which will include the bobblehead and a pre-game autograph session with Lou. More details can be found at cardinals.com/theme. A portion of the proceeds from the regular and VIP tickets will benefit the special Cardinals Care fund. If it’s been said once, it’s been said a million times. The Cardinals’ acquisition of outfielder Lou Brock from the Chicago Cubs on June 15, 1964, ranks as perhaps the greatest steal in baseball history. St. Louis traded pitchers Ernie Broglio and Bobby Shantz and outfielder Doug Clemens in exchange for Brock and pitchers Jack Spring and Paul Toth. Over the course of his career with the Cardinals, Brock established himself as the most prolific base stealer in baseball history to that time. His 938 stolen bases stood as the major league record until Rickey Henderson bettered the mark in 1991. Brock’s total remains the National League standard, and he holds the major league record with 12 seasons of 50 or more steals. Brock led the N.L. in thefts on eight occasions (1966 to 1969 and 1971 to 1974). He set the season record with 118 in 1974, bettering the mark of 104 by Maury Wills during the 1962 campaign. In 1978, the N.L. announced that its annual stolen base leader would receive the Lou Brock Award, making Brock the first active player to have an award named after him. But Brock was more than a base burglar. He was a career .293 batter with 3,023 hits. Seven times he batted at a .300 or better clip. In 1967, Brock slugged 21 home runs and had 76 RBI from the leadoff spot. He also had 52 stolen bases to become the first player in baseball history with 20 homers and 50 steals. The following year, Brock topped the N.L. in doubles (46), triples (14) and stolen bases (62), the first player in the Senior Circuit to do so since Honus Wagner of the Pittsburgh Pirates in 1908. Brock joined the 3,000-hit club Aug. 13, 1979, with a fourth-inning single off Dennis Lamp of the Chicago Cubs at Busch Stadium. Brock and Musial are the only Cardinals members of the 3000-hit club. Brock paid immediate dividends in St. Louis, batting .348 for the balance of the 1964 season and propelling the Cardinals from eighth place in the N.L. to a World Championship over the New York Yankees. The Cardinals won the World Series again in 1967 over the Boston Red Sox and were N.L. champions in 1968. Brock was at his best in postseason play. His .391 career batting average (34-for-87) is a World Series record, while his 14 stolen bases are tied for the most all time with Eddie Collins of the Philadelphia Athletics and Chicago White Sox. 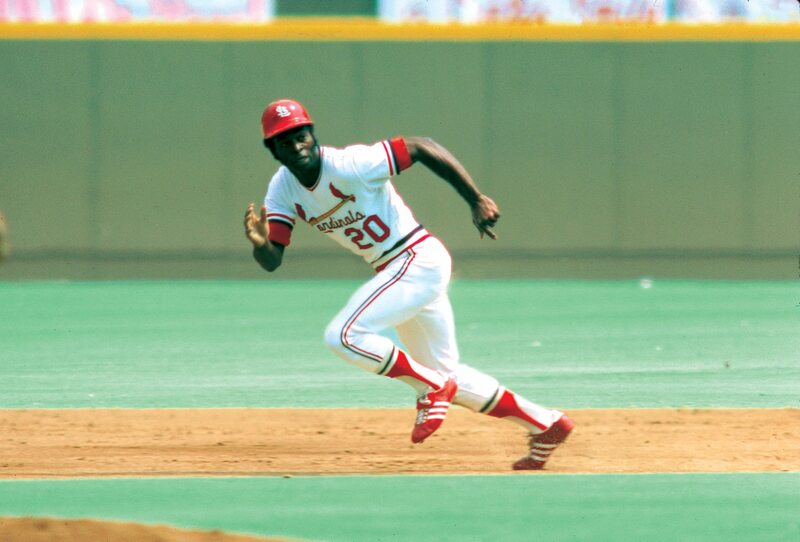 On the Cardinals’ career lists, Brock ranks first in stolen bases (888 – Vince Coleman is second with 549); second in games (2,289), at-bats (9,125), runs (1,427), hits (2,713), doubles (434) and total bases (3,776); fourth in triples (121); fifth in walks (681); and eighth in RBI (814). He was a six-time N.L. All-Star. Brock is second only to Musial in total hits. Brock has remained active in baseball since retiring as a player following the 1979 season. He worked in the Cardinals’ broadcast booth from 1981 to 1984; was a base running consultant for the Minnesota Twins in 1987, Los Angeles Dodgers in 1988 and Montreal Expos in 1993; and has served as a special instructor for the Cardinals (base running and outfield play) since 1995. He was a first-ballot Hall of Fame inductee in 1985. In 2015, Brock was voted by the fans as one of the teams Franchise Four, joining Stan Musial, Bob Gibson and Rogers Hornsby as one of the most impactful players who best represented the history of the St. Louis Cardinals. No one embodies the spirit of St. Louis or the importance of the Cardinals to St. Louis more than Lou Brock. Cardinals Care, the Cardinals’ charitable foundation that supports children, has established a special fund in the name of Lou Brock to help children with diabetes. The Lou Brock fund proceeds will support the American Diabetes Association’s Camp EDI – The Ed and Gloria Hirsch Camp for Children with Diabetes, a one-week resident summer camp held annually at the YMCA’s Trout Lodge in Potosi, Missouri. Besides the typical camp activities, such as swimming, canoeing and arts and crafts, campers participate in daily “wellness classes” and diabetes education with members of their medical staff. The campers learn diabetes self-management skills and the importance of counting carbohydrates, diet and exercise. They also learn to be more independent in their diabetes management while at camp. Most importantly, they are able to interact with other children who relate to the challenges of living with diabetes. Cardinals win their 80th game of the year!